WASHINGTON — The federal deduction for state and local taxes — popular and valuable in South Jersey and Southeastern Pennsylvania — moved closer to elimination Thursday morning. 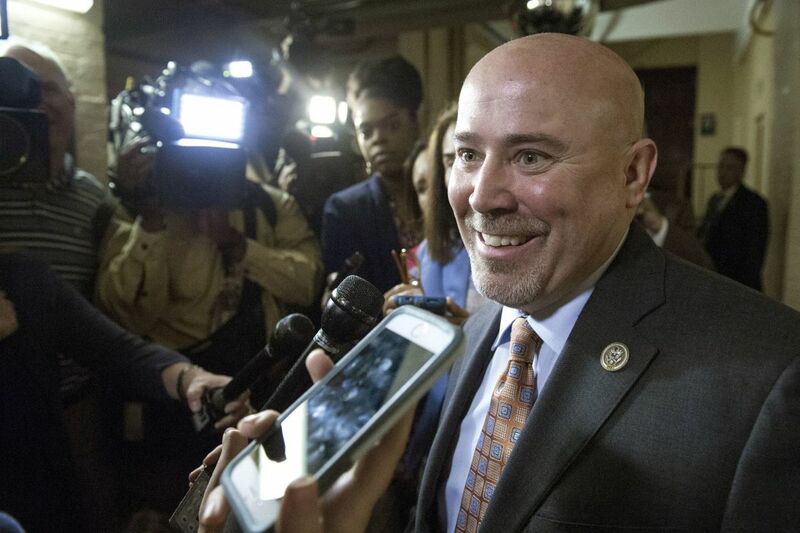 The House voted to advance a budget that targets the deduction, which saves many in the Philadelphia area thousands of dollars on their federal income-tax bills. While that plan is non-binding and still subject to negotiation, its passage means that Republicans hoping to save the tax break just missed one of their best opportunities to stall the process, gain leverage, and force GOP leaders to change course. Had two more Republicans voted no, they would have blocked the plan. Instead, the budget's approval opens up a procedure for Republicans to more easily and quickly pass their tax reform plan, whose broad outline calls for ending the deduction in order to pay for other tax cuts. The vote split Republicans from the Philadelphia area, with South Jersey Reps. Frank LoBiondo and Tom MacArthur opposing the budget, joined by Bucks County's Brian Fitzpatrick. Reps. Ryan Costello of Chester County, Pat Meehan of Delaware County, Charlie Dent of Allentown, and Lloyd Smucker of Lancaster County supported it. "We're seven or eight innings into this and we don't have a deal yet," MacArthur said. But he said there is still enough GOP opposition to stop the tax bill if a deal isn't reached on the deduction. He said many lawmakers voted yes just to keep the process rolling on the top priority for President Trump and the GOP. "Twenty people voted no, and dozens of others voted yes holding their nose, so leadership I think knows clearly that if we don't get this resolved we can't move forward on tax reform," MacArthur said. He said some of those dozens included Pennsylvanians from outside Philadelphia. LoBiondo tweeted that the deduction was a "SERIOUS" concern. New Jersey is one of the states where residents see the largest benefits from the federal deduction, which lets people write off the amounts they paid in state and local taxes. People in the Southeastern Pennsylvania suburbs also rely heavily on the break. In Chester County, for example, 46 percent of filers claimed the deduction, knocking an average of $15,125 off their federal taxable income, according to the most recent IRS data. Repealing the deduction would cost the typical New Jerseyan who claims it around $3,500, according to the nonpartisan Tax Policy Center. The typical Pennsylvanian who uses it would lose roughly $2,200. The tax bill's top advocates, including Sen. Pat Toomey (R., Pa.), contend that if their plans become law fewer people will need the state and local deduction because other changes will make taxpayers less likely to itemize and more likely to use the standard deduction. They say that once all the plan's elements are considered, just about everyone should see a tax cut. While GOP leaders say that tax reform is crucial to their agenda — and to producing some results for supporters in next year's elections — Republicans whose constituents rely on the deduction fear a political backlash. Asked if killing the deduction would be "a death warrant" for New Jersey and New York Republicans, MacArthur said, "I think that's a legitimate risk." Democrats immediately attacked Costello, Meehan and Smucker over their votes, accusing them of turning their backs on their constituents. The actual tax bill, however, has yet to be written and exists mostly as an outline, giving Republicans room to negotiate. Possible compromises up for discussion include letting people deduct either their property tax bills or their state and local income taxes, limiting how much people with high incomes can deduct, or excluding wealthy homeowners from using the deductions. Those ideas would force Republicans to find savings elsewhere. "Tax reform's always challenging because there's winners and losers, and losers yell louder than winners," Dent said. Costello and Meehan both described their votes as important steps to keep tax reform rolling. "The message from my constituents is clear: Tax reform is a priority," Costello said in a statement, vowing to be "very focused on the details that have a significant impact" in his district. Meehan sits on the committee that writes tax laws, giving him a chance to shape the final legislation. A spokesman said the state and local deduction "is certainly a concern" he has voiced to colleagues, and that Meehan is "confident that there will be a resolution." Republican leaders want to repeal the deduction to save $1.3 trillion over the next decade and help pay for broader tax breaks that they say will simplify the tax code and allow them to lower rates across the board. But the large Republican House delegations from New Jersey and New York have threatened to stall the bill unless the state and local deduction is at least partially preserved, making it one of the key stumbling blocks for the tax overhaul. While opponents say the tax break gives a benefit to people in high-tax states at the expense of the rest of the country, MacArthur argued that New Jerseyans are the ones who lose out, since they only get back 61 cents of federal aid for every dollars of taxes they pay. "Don't make us give our money to other parts of the country and then tax us like it's still in our pockets," he said. Republican leaders promise that taxes will fall across the board, even with most deductions eliminated, but people who rely on the state and local write-off could see their savings shrink to near nothing as they benefit from lower rates on one hand but lose a major benefit on the other.